If so, then you can make these little cuties! Seriously, this has got to be one of the cutest ways to recycle–ever! I learned how to make these adorable paper bows at my MOPS meeting today. I’m sure crafting goddesses have long known about this great little idea, but it was all new to me today. And it’s brilliant! I’m picturing cute little home-made bows atop many an upcoming Christmas gift! Magazine ads (colorful with little text probably works best, but you could really use anything. Also, it’s better if the cool design/pretty part is around the edges of the pages vs. the middle), scrapbooking paper, newspaper comics, or any other paper you think would make a cute bow! -Leave 3 strips full length, cut 1″ off 3 strips, cut 2″ off 2 strips, and make the last strip about 3 inches long. Then, make ‘figure 8’s” out of your strips. Fold each end in toward the middle so the pretty sides face out (you will bring each end in the opposite direction), forming the shape of an 8. Staple the ends together in the center. (You will do this for all the strips except the tiny one–that one just loop over to make a little circle). Then, start stacking your 8’s on top of each other (biggest to smallest), arranging in the way you think it looks best. Use the double-sided tape on the bottom of each loop to attach them. Continue this process until you’ve stacked & attached all your 8’s. Then, voila–an adorable magazine bow! The possibilities are endless! Think bridal magazine ads for wedding bows…holiday ads for Christmas bows…so many ways to get super creative!! Fast (less than 5 minutes per bow once you know what you’re doing), frugal, a great way to recycle, and super cute!! A new crafting endeavor to love! Now, go “Get Your Craft On” and “make the world cuter” with these fun little bows! I’m certainly lovin’ it! That's really cute! I've also seen them made out of old maps–you can make them reaallly big that way. What a fabulous idea! 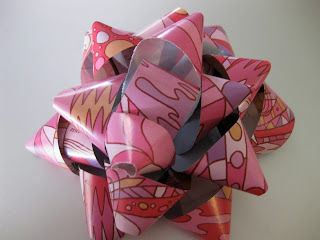 I have NEVER seen these homemade bows, so you weren't the only one that didn't know about them. This would be a great craft to incorporate the children to do…definately bookmarking this one. Ooooh this is new to me. I have never seen how to make bows. I'm thinking leftover scrapbook paper for this! You should come link this up to my Making It With Allie party. Love this! I teach a crafts class at a jr. high and this will be a great project to do around Christmas time. Thanks for sharing! I have made these out of paper but I never thought about magazines. This is a fabulous way to recycle. They are so pretty too! Oh, this is genius. I've got to try this. Thanks! You could do this with ribbon and make a cute hair bow. Awesome ideas! I just tried out the magazine-bow – love it!